Since the Lower American River flows through Sacramento, it is near a host of activities and things to do. We can only give you a small sampling here. Sacramento, the capitol city of the Golden State and home of the Lower American River, is like any major city, full of things to do. Highlights are the Crocker Art Museum, Old Sacramento, the swanky and cool streets of downtown, nightclubs like Harlows and the Blue Lamp, and vintage theatres like the Tower and the Crest. Lots of good restaurants. Or, pack a fantastic picnic for your rafting trip at the incomparable import supermarket Corti Brothers, on Folsom Blvd. For more ideas grab a copy of the Sacramento News and Review, free at most corner newsstands. For a full day or weekend of outdoor activities, bring your bikes and take a ride along the American River bike trail. The path goes from Folsom Lake to downtown Sacramento. You can also ride back to the put-in to pick up your car and run your shuttle. If you want to drive a little ways outside of the city, there are several smaller towns with great tourist attractions. Folsom Lake is the no-brainer destination for water skiing, sunbathing, and floating on inflatable zebras or whatever. 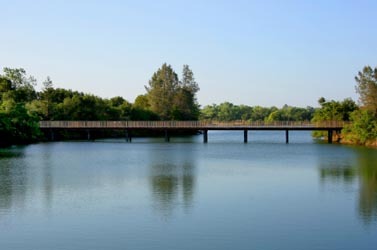 There are also hiking, biking, and horseback riding trails. Call (916) 988-0205 for more info. If you’ve had enough of athletic endeavors you can mosey over to the Folsom Prison gift shop and museum or browse old Folsom’s Sutter street for antiques, jewelry and Native American artwork at Pacific Western Traders. If visiting the pokey isn’t quite your thing and your rafting trip on the Lower American River is around July 4th, you can go to the annual Folsom Rodeo in the evening. If you’re a connoisseur of the ranching and roping arts you might notice that this is hardly America’s best rodeo, but it’s still entertaining and the bulls are still intimidating. El Dorado county is known for whitewater rafting, wineries, gold discovery, and Apple Hill–and of course Poor Red’s famous Gold Cadillacs. It’s about a 45 min drive from Sacramento, so it’s easy to visit after a trip to the Lower American River. You can taste wine, eat apple pies, and picnic in Apple Hill at places like Boeger, Lava Cap, and Madrona wineries, or have a beer at Jack Russell Brewery. Everywhere you look there are apple orchards and fruit stands. Gold Hill and the Coloma-Lotus Valley is also home to wineries, the Gold Discovery State Park (this is where gold was discovered in 1848), the South Fork of the American River, and a fine-dining restaurant, Cafe Mahjaic. Placerville’s Main street has many restaurants and shops selling everything from used books to army surplus, imported cheese, local olive oil, and art.